What is unique, quality content? And how to make Unique Content Articles Blogger posts. It is not a rocket science, unique content on your website/blog is one of the most important things in every search engine (SEO). And unique topic consistently gain your value for readers and search engines also. You just use your some brain and common sense to make new ideas and lets go to write a unique article. Before writing your post, you must collect as much as information about your article's related topic. How To Make Unique Content? How To Make Money Online ...:::: Earn Methods ::::... Let's explain how to make your article unique. First write a short introduction about your article, add some explaining details what your reader can read to learn from your post. So explain your topic related details. Where To Get Quality Content? The good way is to write yourself, if you don't write yourself, so first start writing. Because every person is thinking unique and you know what your product and posts is about. There are some things to make your post are unique. And you write your own post for using these things. So must be happy when you are writing. Always keywords are very important in your content. Use your some kwywords, are different fonts, titles, bold, colors, etc. because reader to find the subjects in your post easily. 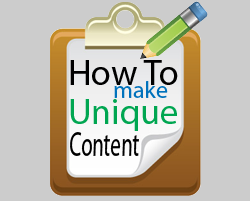 And this tool also helps you to make your content are unique. How To Make Money Online ...:::: Earn Methods ::::... When you are starting writing you must be find spelling mistakes. And after finishing your writing reads your article carefully and highlight or remove your grammar mistakes.